Posted June 29, 2012 by Nate Beaty & filed under News. 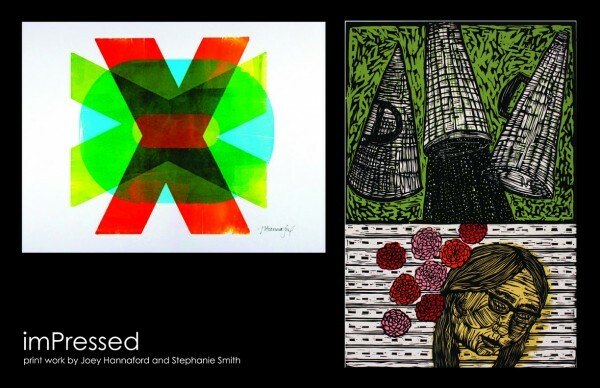 Having been affected and deeply influenced by the work and teaching of Joey Hannaford and Stephanie Smith, Spudnik Press Studio Assistant and Teaching Artist Brandy Barker, curated an exhibition of these two Atlanta artists’ print work. Both artists work in a form of relief printing, ranging from lino & wood cuts to letterpress with an expressive use of color. Visit the exhibition at Spudnik Press beginning Friday, July 13 until August 31, 2012. Spudnik Press gallery is open for viewing Mondays & Thursdays, 6:30pm until 11:00pm and Fridays & Saturdays, 12:30pm until 5:00pm and by appointment.